Designing needlework patterns is fun, but it is even nicer when people who have stitched them write in to show me what they have done, and/or have lovely comments about my designs and this Web site. I wanted to share some of them with you here. Hi Carol - I love your updated site. I've enjoyed receiving your email posts for many years now, and the updated website is just beautiful. Easy on the eyes to look through, organized, informative and very inspirational. It is always nice to feel the "connection" with someone, and feel this website had that in mind. Keep up the great work, and I look forward to visiting your site much more often. 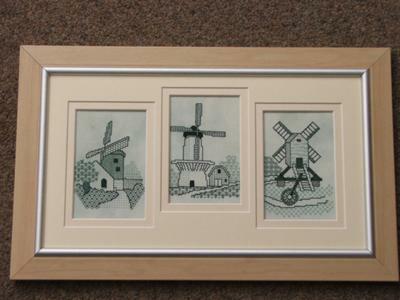 "Our school secretary was due to retire, and her favourite holiday destination was Holland, so I decided to stitch the three blackwork Dutch Windmills as a trio, but matched the colours to her living room, which is mainly greens. Needless to say, she loved the stitching, and has pride of place in her living room. " I have been addicted to cross-stitch for over twelve years now, and have stitched many projects using this technique. But I always wanted to learn something new - different stitches and methods, especially Blackwork. I browsed to Carol's website about a year ago and found her stitching lessons very helpful. I immediately signed up for her Newsletter and started visiting the website regularly. 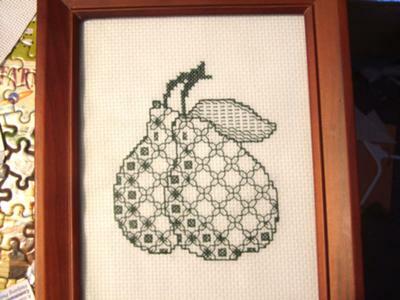 When I started the Blackwork Pears project from your website - about two weeks ago - the first thing I understood was that the stitching process was actually very easy. The difficult part was keeping track of the lines and the number of stitches during the outlining process. I think I actually made one mistake, but I was able to adjust the stitching to it. Thank you very much for your lessons and your pattern, Carol! I so enjoyed stitching it! Next time I will get one of your bigger projects. 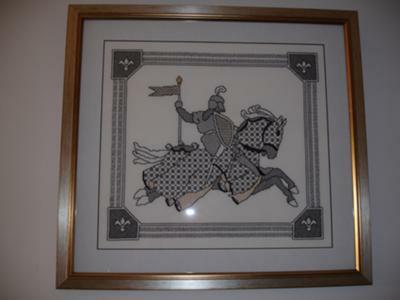 This is a picture of my first black work project, a Black Knight purchased as a kit from a stall at a craft fayre in Cardiff in 2000! Yes, it has taken 9 years but I have not been working on it all that time, honest!! I bought a lovely blackwork instruction book from X-Calibre which explained the basics and also bought the Anchor black work book to assist. I was a little daunted to start with but the instructions on the kit were very good and although progress was slow due to my lack of experience it was very enjoyable. Think the frame really sets it off - go to a local framer called House of Frames who have provided a professional finish I think. My black knight now takes pride of place on my wall and I am still spending much time just looking at him and his magnificent horse and feeling just a little pleased with myself - thank you Carol for giving me so much pleasure.